Background: Phenylketonuria (PKU) is one of the most common inborn errors of amino acids metabolism. It is an autosomal recessive disease that is caused by mutations in phenylalanine hydroxylase (PAH) gene. In the North Africa and Eastern Mediterranean region, E280K missense mutation and c.1055del.G frameshift mutation in PAH gene are one of the most common pathogenic mutations seen in PKU patients. Materials and Methods: In this study, we developed molecular protocols for rapid screening of the PKU patients for these two mutations. These protocols are based on hydrolysis probe real-time polymerase chain reaction technique using allele-specific probes labeled with 6-carboxyfluorescein (FAM) for wild-type (WT) and hexachloro-6-carboxyfluorescein (HEX) for mutant genotypes and Black Hole Quencher 1 as a quencher and high-resolution melting analysis using EvaGreen saturating dye. Results: There was complete accordance between the developed protocols in differentiating genotypes and they proved to be rapid, sensitive, and efficient for the detection and differentiation between WT, mutant, and heterozygous genotypes of the E280K and c.1055del.G mutations. Conclusions: These protocols allow easy molecular screening of the mutations studied among the families of affected people, especially for premarital screening. So far, the only known mutations that cause PKU in Libyans are E280K and/or c.1055del.G. E280K or Glu280Lys results from the G838A mutation that changes codon GAA into AAA, and c.1055del.G also named G352V or Gly352Val results from the deletion of a G at position 1055 leading to a frameshift mutation resulting in codon change from GGT into GTG. Several techniques are already established for the mutation detection. These differ in their safety, precision, time, and cost. Hydrolysis probe real-time polymerase chain reaction (PCR) technique and high-resolution melting (HRM) analysis techniques are very well established for mutation detection. These are closed-tube and therefore safe to perform, relatively cost-effective, rapid, and highly precise. The aim of the current study was to develop hydrolysis probe-based real-time PCR and HRM protocols for rapid detection of these two mutations. These protocols will be used for rapid screening of suspected cases and for identifying carriers of these mutations in the families of PKU patients to help counsel. The DNA of 68 individuals was used to validate the developed protocols: 26 individuals from three families of probands diagnosed with PKU with E280K mutation, 30 individuals from two families of probands diagnosed with PKU with c.1055del.G deletion, and 12 individuals from two families of probands diagnosed with PKU with compound heterogeneous mutations E280K/c.1055del.G. The individuals included the affected children, parents, siblings and may include aunts, uncles from both sides, and grandfathers and grandmothers when possible. Blood samples were collected in ethylenediaminetetraacetic acid tubes and frozen at −20°C until used for DNA extraction. All adults signed informed consent for themselves and parents for their affected children. The study was approved by the Bioethics Committee of Libyan National Center for Diseases Control. Genomic DNA was extracted from peripheral blood leukocytes using the Qiagen QIAamp DNA Mini Kit (Qiagen, Valencia, CA, USA) according to the manufacturer's instructions. The resultant genomic DNA was run on 1% agarose gel to confirm quality, and the quantity and purity were assessed using a SmartSpec Plus Spectrophotometer (Bio-Rad Laboratories Inc., CA, USA). The GenBank: AC069227.24 sequence was used to design the primers and probes for the E280K and c.1055del.G mutations detection. The primers and probes were designed using Oligo Analyzer 1.5 software (Gene Link™) (Kuopio, Finland) and bought from Metabion (Metabion, Martinsried, Germany). The sequences of the primers and probes used for E280K mutation detection were as follows: 7PAHA 5'-CTGCTTTCCTCTCGGGATTTC-3' (melting temperature [Tm] = 61.3°C), 7PAHB 5'-GAACCCAAACCTCATTCTTG-3' (Tm = 56.4°C), 7PAHf 5'-FAM-CATGTATACCCCCGAACCGTGAG-BHQ-1-3' (Tm = 66.4°C), 7PAHh 5'-HEX-CATGTATACCCCCAAACCGTGAG-BHQ-1-3' (Tm = 64.6°C), and the sequences of the primers and probes used for c.1055del.G mutation detection were as follows: 10PAHA 5'-TCCATAAAGGCATATGGTGC-3' (Tm = 56.4°C), 10PAH 5'-CTTTTAAATCTATCCTTGGTTCC-3' (Tm = 57.50 C), 10PAHf 5'-FAM-CATCCTTTGGTGAATTACAGGTA-BHQ-1-3' (Tm = 59.3.6°C), 10PAHh 5'-HEX-CATCCTTTGTGAATTACAGGTATG-BHQ-1-3' (Tm = 60.1°C). The accuracy of the designed primers and probes sequences was verified by comparison with the GenBank database using Basic Local Alignment Search Tool (http://www.ncbi.nlm.nih.gov/BLAST/). The E280K primers would produce an 181 bp amplicon while primers for c.1055del.G would produce an amplicon of 88 bp. The allele-specific probes for wild-type (WT) were labeled with FAM at the 5' end and the Black Hole Quencher (BHQ)-1 as a quencher at the 3' end. The probes for the detection of mutant alleles were labeled with HEX at the 5' end and the BHQ-1 as a quencher at the 3' end. The PCR was carried out using Mx3005P (Stratagene/Agilent Technologies Company, CA, USA). Reaction mixes of 25 μl contained 12.5 μl 2X mi-real-time Probe Master (Taq polymerase: 0.05 U/μl, dNTPs [dATP, dCTP, dGTP, dUTP] [200 μM], reaction buffer with KCl and MgCl2 [3 mM], stabilizers) from Metabion (Metabion, Martinsried, Germany), 0.75 μl of 10 pmol/μl of each primer and probe, and 10–60 ng genomic DNA or serial dilution of 30 ng, 6.0 ng, 1.2 ng, 0.24 ng, 0.048 ng, and 0.0096 ng for standard curve creation and amplification efficiency estimation. The thermal profile for E280K detection contained one cycle of Taq polymerase activation at 95°C for 2 min followed by forty cycles of 95°C for 15 s, 56°C for 30 s, and 65°C for 30 s, and the thermal profile for c.1055del.G deletion was the same as above except annealing temperature that was 55°C for 30 s. The signal was collected at the end of annealing step. All study samples that were genotyped using hydrolysis probe real-time PCR (allelic discrimination) method were additionally tested by HRM analysis. HRM analysis was performed on a Rotor-Gene Q real-time rotary analyzer (QIAGEN GmbH). The primers used for E280K HRM were 7PAHA and 7PAHB, and those used for c.1055del.G HRM were 10PAHA and 10PAHB. Reaction mixes of 25 μl contained 12.5 μl 2X mi-real-time EvaGreen ® Master (Taq polymerase: 0.05 U/μl, dNTPs [dATP, dCTP, dGTP, dUTP] [200 μM], reaction buffer with KCl and MgCl2 [3 mM], EvaGreen ®, stabilizers) from Metabion (Metabion, Martinsried, Germany), 0.75 μl of 10 pmol/μl of each primer, and 10–60 ng genomic DNA. The thermal profile for E280K mutation contained one cycle of Taq polymerase activation at 95°C for 2 min followed by fifty cycles of 95°C for 5 s, 58°C for 10 s, and 72°C for 20 s. After amplification, HRM analysis data were collected from 80°C to 90°C, with each step raised by 0.05°C, followed by a waiting time of 1 s.
The thermal profile for c.1055del.G deletion was the same as above except annealing temperature that was 55°C for 30 s, and the HRM analysis data were collected from 70°C to 85°C, with each step raised by 0.05°C, followed by a waiting time 1 s.
The development of hydrolysis probe real-time PCR (allelic discrimination) and HRM protocols for the screening of E280K point mutation and c.1055del.G deletion was chosen because these two mutations are among the most prevalent PAH mutations in Mediterranean region and the only known cause of PKU in Libyan patients and hence to use these simple, safe, and rapid techniques in screening for these mutations. To assess the sensitivity, accuracy, and efficiency of the primers and hydrolysis probes used, we prepared serial dilutions of the DNA templates with homozygote genotypes, i.e., WT and mutant to produce linear standard curves including 30 ng (~4870.1 cells), 6 ng (~974.0 cells), 1.2 ng (~194.81 cells), 0.24 ng (~38.96 cells), 0.048 ng (~7.79 cells), and 0.0096 ng (~1.56 cells), given that the human somatic cell has 6.16 pg genomic DNA. The samples were tested and in this way the amplification efficiency (E) was estimated. The result of real-time PCR standard curves for (a) E280K mutant probe with HEX dye showed that the R2 = 0.998, slope = −3.32, and efficiency = 100%; (b) E280K WT probe with FAM dye showed that the R2 = 0.956, slope = −3.37, and efficiency = 98%; c.1055del.G mutant probe with HEX dye showed that the R2 = 0.996, slope = −3.35, and efficiency = 90.7%; and c.1055del.G WT probe with FAM dye showed that the R2 = 0.997, slope = −3.5, and efficiency = 91.3%. The standard curves showed that the limit of detection for all sets of primers and probes is 7.79 diploid cells. These results reveal that the assays conditions are sensitive, accurate, and efficient. The genotyping was performed using standard hydrolysis probe real-time PCR (allelic discrimination) analysis with two probes labeled with FAM and HEX fluorescent for WT and mutant genotypes, respectively. Four PCR amplification patterns are expected. 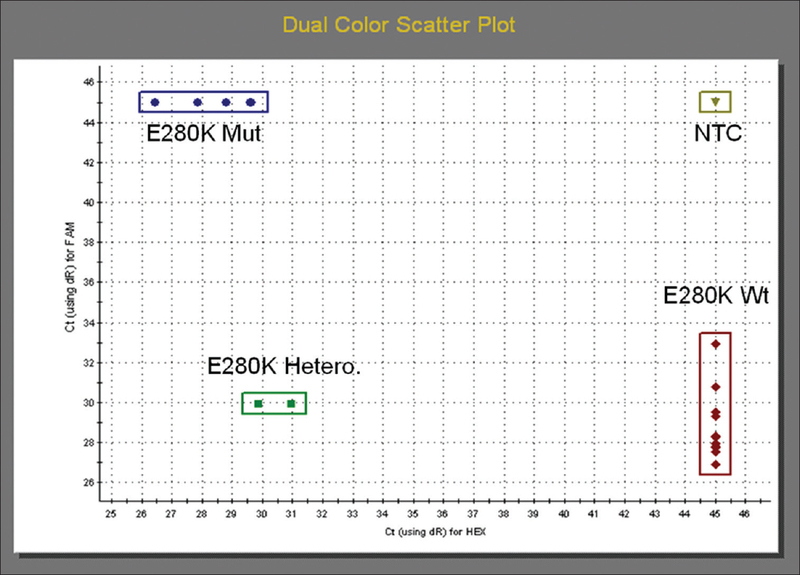 In the case of E280K, the WT samples (G838G genotype) would be identified by the detection of FAM fluorescence at the green channel only, which is attributed to degradation of the WT probe, the mutant samples (A838A genotype) would be identified by the detection of the HEX fluorescence at yellow channel only, which is attributed to degradation of the mutant probe, and the heterozygous samples (G838A genotype) would be identified by the detection of both dyes FAM and HEX, and in the nontemplate control (NTC) to which no DNA was added, there would be no fluorescence detected. [Figure 1] shows that there is clear segregation of different genotypes in the scatter plot produced. It shows the result of allelic discrimination analysis of four patients known to be homozygous for E280K mutation or A838A genotype (top left), nine samples from WT or G838G genotype (bottom right), two samples from carriers of E280K mutation or G838A genotype (bottom left), and NTC (top right). The genotype of the studied samples was confirmed using high-resolution analysis. 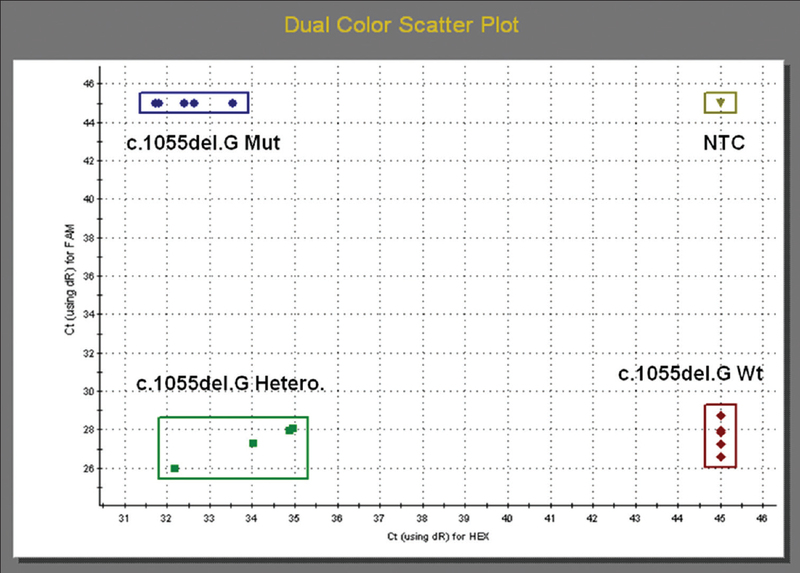 In the case of c.1055del.G, the WT samples (G1055G genotype) would similarly be identified by the detection of the FAM fluorescence at the green channel only, which is attributed to degradation of the WT probe, the mutant samples (c.1055del.G genotype) would be identified by the detection of the HEX fluorescence at yellow channel only, which is attributed to degradation of the mutant probe, and the heterozygous samples would be identified by simultaneous detection of both dyes FAM and HEX, and in the NTC to which no DNA was added, there would be no fluorescence detected. [Figure 2] shows that there is clear segregation of different genotypes in the scatter plot produced. It shows the result of allelic discrimination analysis of five patients known to be homozygous for c.1055del.G mutation genotype (top left), five samples from WT genotype (bottom right), five samples from carriers of c.1055del.G mutation genotype (bottom left), and NTC (top right). The genotype of the studied samples was confirmed using high-resolution analysis. The tested samples were those used for hydrolysis probe technique. All samples were successfully amplified and underwent postamplification HRM analysis. 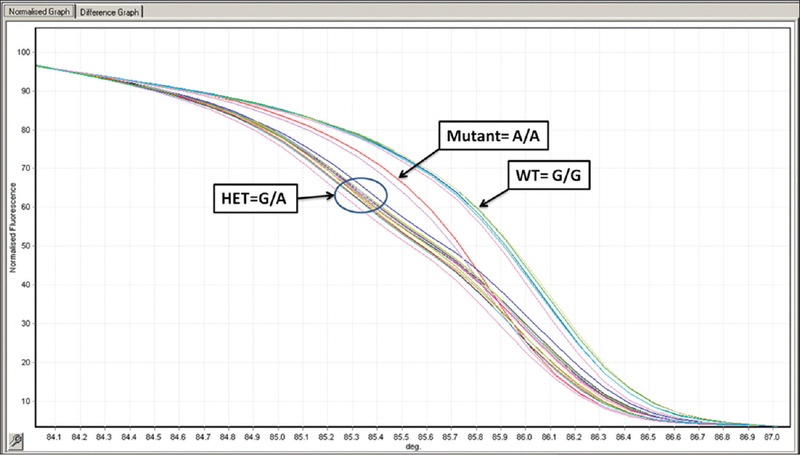 [Figure 3] and [Figure 4] show the normalized melt curves of HRM analysis for E280K (G838A) mutation and c.1055del.G deletion of PAH gene. 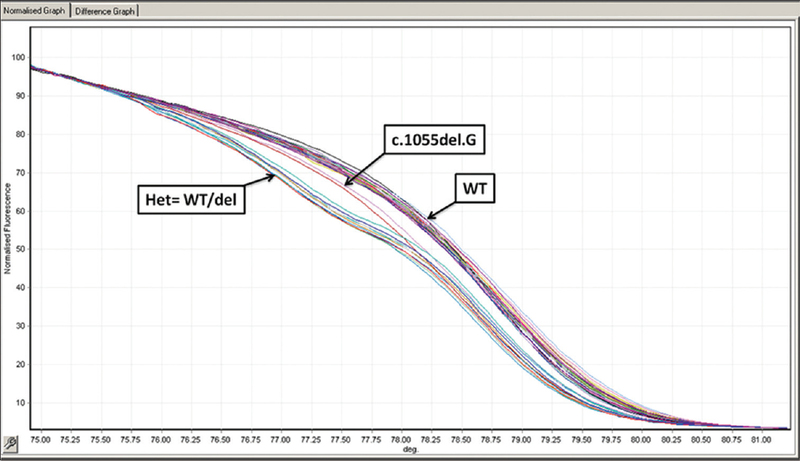 The melting curves have distinguishable shapes, clearly different for heterozygous, homozygous mutated, and homozygous WT samples, differentiating genotypes of E280K mutation and c.1055del.G deletion. [Figure 3] shows three different patterns, for WT (G/G), mutant (A/A), and heterozygous (G/A) produced by primers of E280K mutation. The heterozygous is first to melt as there are no hydrogen bonds between G and A, followed by the mutant as there are two hydrogen bonds between A and T and finally the WT as there are three hydrogen bonds between G and C.
[Figure 4] shows three different patterns, for WT, mutant (deletion), and heterozygous (WT/del) produced by primers of c.1055del.G deletion. The heterozygous is first to melt as there are no hydrogen bonds between the WT and deletion, followed by the mutant as the amplicon lacks G-C bonding and finally the WT as there are three hydrogen bonds between G and C.
The normalized melt curves, [Figure 3], shows HRM profiles of two patients known to have E280K PAH mutation compared to five WT and nine heterozygous samples, and [Figure 4] shows HRM profiles of two patients known to have c.1055del.G deletion as compared to nine WT and seven heterozygous samples. The results showed that there was 100% consistency between hydrolysis probe and HRM techniques. PKU is one of the most common inborn errors of metabolism. This genetic disorder follows the autosomal recessive mode of inheritance. Undiscovered and untreated PKU patients would develop serious phenotype manifested in growth failure, irreversible mental retardation, as a result of accumulation of toxic metabolites of phenylalanine metabolism, microcephaly, and seizures. In North Africa and the Middle East, the consanguineous marriage is highly common.,, This would help in the spread of the genetic diseases in families that carry mutations causing these diseases. E280K mutation in exon 7 and c.1055del.G deletion in exon 10 of PAH gene are common in the Mediterranean region and most specifically in North Africa. They were found to be common in Algeria, Libya, Morocco, and Tunisia. Premarital and molecular screening and detection of family's members carrying these mutations would help in providing genetic counseling and hence would help in reducing the spread of the disease. Several molecular genetics techniques have been developed and are being used for the screening of PAH mutations. These include PCR-restriction fragment length polymorphism, allele-specific oligonucleotide hybridization, denaturing gradient gel electrophoresis (DGGE),,, denaturing high-performance liquid chromatography (DHPLC), PCR-single strand conformation polymorphism (SSCP) analysis technique, DNA direct sequencing,, real-time PCR based on hydrolysis probe real-time PCR technology, and HRM. In this paper, we report the development of molecular protocols for detection of E280K mutation in exon 7 and c.1055del.G deletion in exon 10 based on the hydrolysis probe real-time PCR and HRM analysis. The amplification efficiency of the PCR conditions including primers and probes work was performed using the standard curve method of Pfaffl and Hageleit. All readings obtained were within the acceptable limits, i.e., the slopes reading between −3.1 and −3.6 and reaction efficiencies between 90% and 110% are typically acceptable. These readings were obtained using the efficiency calculation formula = −1 + 10(−1/slope). These readings suggested that our primers and probes are working properly for both mutations and that these reactions conditions could be used in the allele discrimination testing and HRM. Hydrolysis probe real-time PCR is characterized by its high specificity as the probes would hybridize to their specific alleles. Using two dual-labeled probes that differ in only one nucleotide would discriminate between their matching alleles. The hybridized probes would be hydrolyzed giving fluorescence as a consequence of liberating the reporter from the vicinity of the quencher. The fluorogenic-specific probes, labeled with two spectrally distinct dyes, would discriminate between two different alleles. Here, we used WT-specific probes labeled with FAM at 5' end as a reporter and BHQ-1 at 3' end as a quencher and mutant-specific probes labeled with HEX at 5' end as a reporter and BHQ-1 at 3' end as a quencher. FAM absorbs light at 495 nm and emits it at 520 nm (green), while HEX absorbs light at 535 nm and emits it at 556 nm (yellow). Our results showed clear allelic discrimination between WT alleles and mutant alleles, segregating WT, mutant, heterozygous, and NTC. The HRM analysis is characterized by its simplicity and low cost as it uses only two primers and saturating dye. In this study, the amplicon produced by E280K mutation primers is 181 bp and the amplicon of c.1055del.G is 88 bp. These are relatively short and allowed clear discrimination between WT, carriers, and homozygous mutant using HRM analysis. However, although the amplicon of E280K is larger than that of c.1055del.G, it gave clearer discriminating profiles. One of the most important advantages of HRM technique is that it can detect unknown mutations. However, in our protocol, there were no odd profiles, suggesting that there are no other mutations in the amplified regions of exons 7 and 10 other than E280K and c.1055del.G, respectively. In both techniques, the amplification and mutation detection steps are done at the same time (closed tube) and hence do not need postamplification processing. This would reduce the time on hands, would eliminate the possibility of contamination, and would reduce the possibility of exposure to ethidium bromide and ultraviolet, which are carcinogenic factors, used for the end-point PCR detection. Our results show that both protocols successfully detected E280K mutation in exon 7 and c.1055del.G deletion in exon 10 and that there was 100% consistency between these protocols. The results of families' members confirmed each other. However, one case that was previously reported as having a compound heterozygous mutation (E280K/c.1055del.G) was found to be homozygous for E280K mutation using both hydrolysis probe real-time PCR and HRM techniques. This also was confirmed by the results of parents and relatives genotypes which were found to be carriers of E280K mutation only. In comparison with other molecular screening protocols such as DGGE, DHPLC, SSCP, and sequencing, our developed protocols were proven to be highly efficient, sensitive, precise, rapid, and safe to use. We have reported new protocols for molecular screening of E280K and c.1055del.G mutations in PAH gene-based hydrolysis probe allelic discrimination real-time PCR and HRM analysis. These protocols are rapid, robust, and highly sensitive and are easy to perform. This work was carried out in the laboratory of the Libyan National Center for Diseases Control (NCDC). We would like to thank all the NCDC laboratory staff and patients and families who participated in this study. Bickel H, Gerrard J, Hickmans EM. Influence of phenylalanine intake on phenylketonuria. Lancet 1953;265:812-3. Friedman PA, Fisher DB, Kang ES, Kaufman S. Detection of hepatic phenylalanine 4-hydroxylase in classical phenylketonuria. Proc Natl Acad Sci U S A 1973;70:552-6. Erlandsen H, Stevens RC. The structural basis of phenylketonuria. Mol Genet Metab 1999;68:103-25. Available from: http://www.pahdb.mcgill.ca/cgi-bin/pahdb/mutation_statistics-1.cgi. [Last accessed on 2015 Mar 20]. Santos LL, Magalhães Mde C, Reis Ade O, Starling AL, Januário JN, Fonseca CG, et al. Frequencies of phenylalanine hydroxylase mutations I65T, R252W, R261Q, R261X, IVS10nt11, V388M, R408W, Y414C, and IVS12nt1 in Minas Gerais, Brazil. Genet Mol Res 2006;5:16-23. Guldberg P, Rey F, Zschocke J, Romano V, François B, Michiels L, et al. A European multicenter study of phenylalanine hydroxylase deficiency: Classification of 105 mutations and a general system for genotype-based prediction of metabolic phenotype. Am J Hum Genet 1998;63:71-9. Hofman KJ, Steel G, Kazazian HH, Valle D. Phenylketonuria in U.S. blacks: Molecular analysis of the phenylalanine hydroxylase gene. Am J Hum Genet 1991;48:791-8. Pérez B, Desviat LR, Díe M, Cornejo V, Chamoles NA, Nicolini H, et al. Presence of the Mediterranean PKU mutation IVS10 in Latin America. Hum Mol Genet 1993;2:1289-90. Pérez B, Desviat LR, De Lucca M, Cornejo V, Raimann E, Ugarte M. Molecular characterization of phenylalanine hydroxylase deficiency in Chile. Mutations in brief no 243. Online. Hum Mutat 1999;13:503. Waters PJ. How PAH gene mutations cause hyper-phenylalaninemia and why mechanism matters: Insights from in vitro expression. Hum Mutat 2003;21:357-69. Yang Y, Drummond-Borg M, Garcia-Heras J. Molecular analysis of phenylketonuria (PKU) in newborns from Texas. Hum Mutat 2001;17:523. Zschocke J. Phenylketonuria mutations in Europe. Hum Mutat 2003;21:345-56. Michals K, Matalon R. Phenylalanine metabolites, attention span and hyperactivity. Am J Clin Nutr 1985;42:361-5. Williams RA, Mamotte CD, Burnett JR. Phenylketonuria: An inborn error of phenylalanine metabolism. Clin Biochem Rev 2008;29:31-41. Al Mutawa HS, Elrfifi K, Zeglam A, Ben-Omran T, Aboureyana F, Al-Hmadi S, et al. Molecular analysis of phenylalanine hydroxylase (PAH) gene from dried blood spots from Libyan phenylketonuria patients. Qatar Found Annu Res ForumProc 2010;2010:24.
el-Hazmi MA, al-Swailem AR, Warsy AS, al-Swailem AM, Sulaimani R, al-Meshari AA. Consanguinity among the Saudi Arabian population. J Med Genet 1995;32:623-6. Tadmouri GO, Nair P, Obeid T, Al Ali MT, Al Khaja N, Hamamy HA. Consanguinity and reproductive health among Arabs. Reprod Health 2009;6:17. Kingston HM. ABC of Clinical Genetics. 3rd ed. London: BMJ Books; 2002. Lyonnet S, Caillaud C, Rey F, Berthelon M, Frézal J, Rey J, et al. Molecular genetics of phenylketonuria in Mediterranean countries: A mutation associated with partial phenylalanine hydroxylase deficiency. Am J Hum Genet 1989;44:511-7. Dahri S, Desviat LR, Pérez B, Leal F, Ugarte M, Chabraoui L. Mutation analysis of phenylketonuria patients from Morocco: High prevalence of mutation G352fsdelG and detection of a novel mutation p.K85X. Clin Biochem 2010;43:76-81. Khemir S, Siala H, Taieb SH, Cherif W, Azzouz H, Kéfi R, et al. Screening of three Mediterranean phenylketonuria mutations in Tunisian families. J Genet 2012;91:91-4. Desviat LR, Pérez B, De Lucca M, Cornejo V, Schmidt B, Ugarte M. Evidence in Latin America of recurrence of V388M, a phenylketonuria mutation with high in vitro residual activity. Am J Hum Genet 1995;57:337-42. Rivera I, Leandro P, Lichter-Konecki U, Tavares de Almeida I, Lechner MC. Population genetics of hyperphenylalaninaemia resulting from phenylalanine hydroxylase deficiency in Portugal. J Med Genet 1998;35:301-4. Guldberg P, Güttler F. 'Broad-range' DGGE for single-step mutation scanning of entire genes: Application to human phenylalanine hydroxylase gene. Nucleic Acids Res 1994;22:880-1. Kozák L, Blazková M, Kuhrová V, Pijácková A, Ruzicková S, St'astná S. Mutation and haplotype analysis of phenylalanine hydroxylase alleles in classical PKU patients from the Czech Republic: Identification of four novel mutations. J Med Genet 1997;34:893-8. Daniele A, Cardillo G, Pennino C, Carbone MT, Scognamiglio D, Correra A, et al. Molecular epidemiology of phenylalanine hydroxylase deficiency in Southern Italy: A 96% detection rate with ten novel mutations. Ann Hum Genet 2007;71:185-93. Sun G, Jiang L, Zhang X, Tong B, Dong G, Sun K. Mutations identified in exon 7 of phenylalanine hydroxylase gene in Chinese. Chin Med Sci J 1997;12:156-8. Georgiou T, Ho G, Vogazianos M, Dionysiou M, Nicolaou A, Chappa G, et al. The spectrum of mutations identified in Cypriot patients with phenylalanine hydroxylase deficiency detected through neonatal screening. Clin Biochem 2012;45:588-92. Dobrowolski SF, Ellingson C, Coyne T, Grey J, Martin R, Naylor EW, et al. Mutations in the phenylalanine hydroxylase gene identified in 95 patients with phenylketonuria using novel systems of mutation scanning and specific genotyping based upon thermal melt profiles. Mol Genet Metab 2007;91:218-27.